THE Malvern Chase Brass Band handed over a cheque for more than £1,000 to the Link Nurseries Horticultural Therapy Centre. The handover happened at the latest coffee morning held at the centre in Powick, which provides occupational therapy for adults recovering from serious mental illness. The band raised the money, a total of £1,150, by playing carols and other seasonal favourites in the run-up to Christmas. 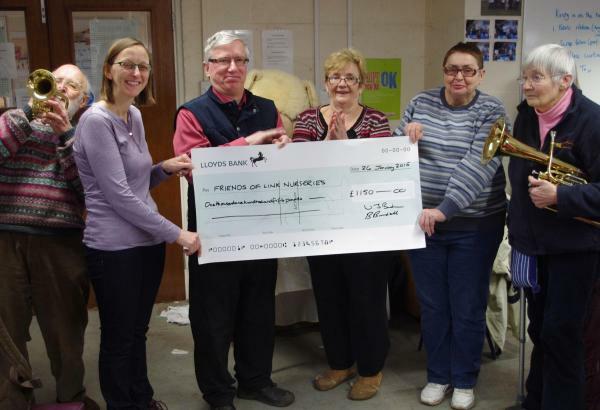 Judith Aldridge of the Friends of Link Nurseries said: “‘We are so grateful to the band for this most generous donation to our latest fund-raising project, which is the repair and refurbishment of the automatic watering systems at the nurseries.